Billy Sharp Celebrates scoring the game's only goal. Billy Sharp's first half strike proved to be the game's only goal, but it could have been more by the time the full-time whistle blew. 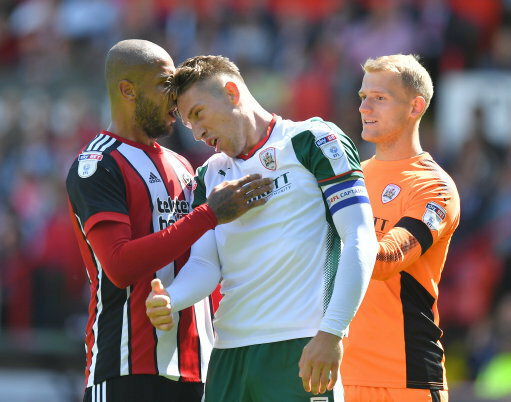 The game was spoilt by one first half incident involving Reds Angus MacDonald and Blades Leon Clarke which saw referee Robinson awarded a double sending off after consulting with his assistant. Prior to the match, Chris Wilder made two changes to the starting XI which had lost 2-0 at Cardiff in midweek. Jake Wright replaced an injured Richard Stearman (hamstring) in defence, and Mark Duffy was preferred to Samir Carruthers in midfield. The early momentum of the match came at a frantic pace as United set their stalls out early on. United won a succession of corners and fired crosses into the box from both flanks. With just 6 minutes played the hosts carved out their best chance yet and were denied by an acrobatic save from Davies. A quick throw-in saw a neat path find Stevens on the by-line and his low cross fell beautifully for Sharp and his low shot was kept out by the keeper. Soon afterwards Duffy's free-kick bounced off the wall and over for a corner. The opener wouldn't be far behind but at the other end, Barnsley attempted to catch United on the break throughout but offered little in front of goal. On one rare attack, Hammill pulled a shot wide. On 17 minutes O'Connell's overlap saw the magician fire in a hard low cross for SHARP to latch onto and his first time effort bobbled past a scrambling Davies in front of the away support. Barnsley flitted with possession in United's final third without making any waves as they tried to get back into the game. The game heated up on 42 minutes as a ball forward was gathered up by Davies. As Clarke and MacDonald chased, a scuffle saw Clarke retaliate to an elbow, and put his hands around the defenders neck, who in turn gestured a head but. After the referee consulted with his assistant, he was given no choice but to send both players off. United remained on top despite a lack of fire power up front, Sharp resigned to playing on his own. Duffy, who was named Man of the Match, was heavily involved, he lay off Fleck but his drive from the edge of the box was blocked by Jackson. In another attack, O'Connell headed Duffy's free-kick wide. Naughty, Naughty very Naughty. Clarke and MacDonald go head to head - earning them both a deserved red card. The Tykes made a double change at the break with Ugbo and Pennock replacing McCarthy and Moncur. The second half saw both Duffy and United remain a constant threat, although it was O’Connell who tried his luck from distance twice, but neither hit the target. Just before the hour mark, Duffy dragged an effort wide following a well worked move between five team mates. At the other end, Potts headed over at the near post following a corner. United almost doubled their lead, as Freeman surged forward, Basham's overlap saw the defender hit a first time cross onto the far post but Sharp was stretching and unable to steer the ball into the net. On 66 minutes the Blades made their first change of the game as David Brooks replaced Duffy. Brooks looked lively from the off and his fine dribbling saw him beat Pinnock but his effort was blocked. On 70 minutes he went even closer and many supporters in the stadium couldn't believe how it didn't trickle over the line. From a Stevens cross, Brooks first time shot, Davies got something onto it but it fizzed through his legs and spun across goal before nestling against the far post. O'Connell was the next to be denied as the towering defender found himself unmarked at a Fleck corner, and his powerful header was tipped over by Davies. With 15 minutes remaining, Evans replaced a tiring Sharp. The five minutes saw Barnsley push United back, desperate for a leveller but Potts and Hammill failed to hit the target from their efforts and Ugbo's turn in the box looked dangerous but Wright read it to quickly move in and clear any threat as a solid Blades performance secured maximum points. Sheffield United: Blackman, Stevens, Fleck, O'Connell, Basham, Clarke, Sharp (Evans 75), Wright, Coutts, Freeman, Duffy (Brooks 66). Unused: Lundstram, Lafferty, Eastwood, Brayford, Carruthers. Barnsley: Davies, McCarthy (Ugbo 45), Williams, MacDonald, Hammill, Bradshaw (Thiam 79), Moncur (Pennock 45), Jackson, Potts, Pearson, Hedges. Unused: Townsend, Barnes, Mowatt, Bird.